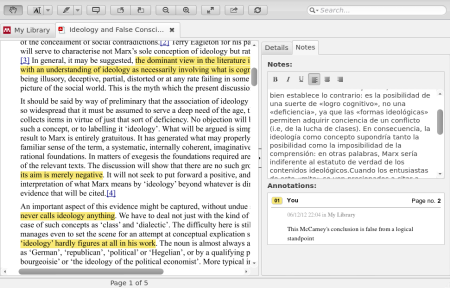 Evince 3.6.1 (the default PDF viewer) now supports adding annotations and bookmarks (proper PDF bookmarks), that are saved with the document. Since Evince 3.14 you can add and delete annotations. I suggest you try these two programs and choose the one that better fits your needs. All annotations are hand made (so to speak). You can print them on the PDF, if you want, or you can set them apart. Download from here. Very useful to keep track of your research notes. 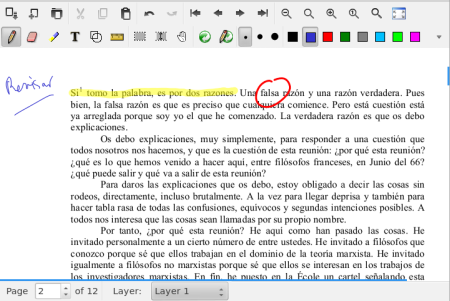 The version of Okular (0.19.3) found in at least Ubuntu 14.04 now also supports customising the review toolbar (the toolbar for adding annotations) by adding and modifying the various annotation types that can be selected. Xournal would be worth taking a look at. 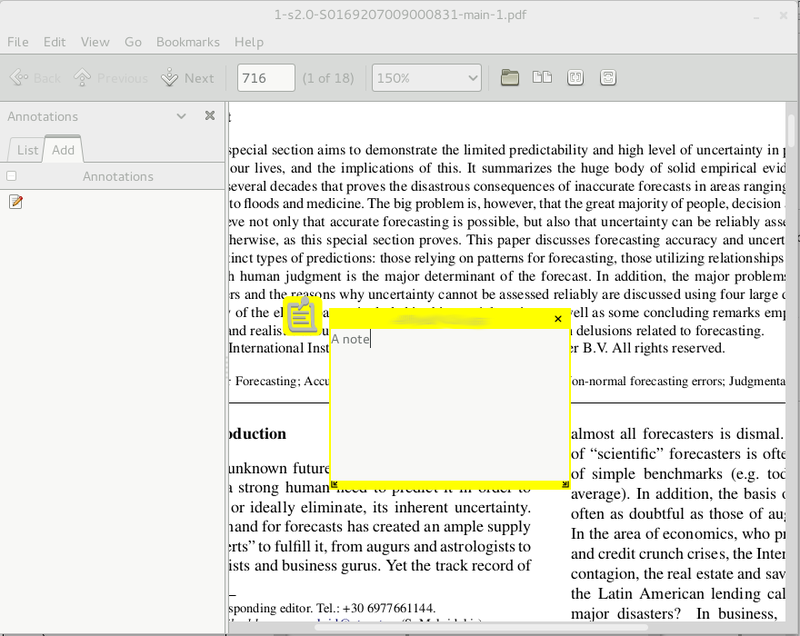 Annotations and modifications are stored in a separate file but can be easily exported to PDF. I don't think there's any PDF editor out there that supports any kind of sophisticated math notation, but I might be mistaken. Try qpdfview . It is fast, customizable and has rudimentary annotation support. A recent version can be installed by adding this launchpad ppa. PDF-X-Change Viewer is fairly good. You have to run it under Wine, though. Or you could look at pdfedit . There is yet another alternative. You can install Adobe Reader. The latest linux version is 9.5.5 (which is dated compared to W$ and Mac versions). It allows for editing and commenting. You do have to enable the editing and commenting toolbars (right click on the toolbar and select). For doing proofreading when working with a publisher this is the way to go. Why i cannot comment with my Acrobat reader 9.5.1? How to add DRM protection to my DRM-free ebooks?